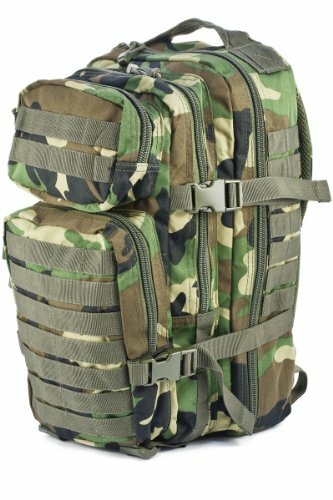 This heavy duty and water-proof 20 liters assault pack features 2 huge compartments with Quite a lot of zip and mesh inner pockets and 2 small front pockets, in addition to a built-in Velcro pocket for a hydro pack. All compartments are closed with robust 2-manner zippers. Ergonomically designed shoulder straps are padded, about 5cm wide and adjustable in length. Additionally the pack is going with a padded back and an adjustable waist strap opened with a clip. The pack lets in for volume regulate and luggage fixation way to plenty of a lateral compression straps and provides a chance to connected additional equipment thru plenty of powerful nylon MOLLE straps all-spherical, and loops and D-rings on shoulder straps. The pack offers a large amount of sporting area and is absolute best for military in addition to camping and mountain climbing. * Up to date, never worn, prime quality product in Mint Condition!